A screen icon is reunited with his fastest co-star! 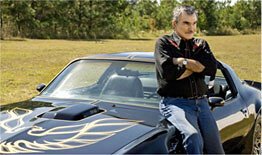 The Bandit himself, Burt Reynolds, joins DIY Network to recreate the famous Trans Am. Burt will bring 2007 upgrades to this classic model under the hood and in the cockpit. However, the design is pure Bandit! This is a complete restoration from front to back, and DIY goes inside every turn of the screw. Thirty years ago, a relatively low-budget movie starring an ex-Florida State football player, a country singer, a comedic legend and a black-and-gold Trans Am swept the country. Smokey & The Bandit played a huge role in a number of areas, not the least of which were catapulting Burt Reynolds to stardom and resulting in record-breaking sales for Pontiac‘s Trans Am. To celebrate the 30th anniversary of this milestone movie, and the car that powered it, YearOne and Burt Reynolds are teaming up to build a very limited number of special Trans Ams – all black and gold, of course. Instead of simply restoring original cars to their original specification, the YearOne Bandit cars will be completely modernized both stylistically and mechanically. The YearOne design team, working with input from Burt Reynolds, has come up with a look that both pays its respects to the original while updating key areas. Subtle body mods will include a cleaner integration of the iconic wheel flares into the body, flush-mounted glass, updated lighting and a modernized graphic package. Mechanically, the cars will be available in three different stages, ranging from high-performance to mind-blowing. Power will include traditional Pontiac V8s ranging in output from 400+ to 700+, along with a modern LS7 (from the current Z06 Corvette) making 600+ horsepower. Modern overdrive transmissions will be offered, as will various suspension variations.